Here are some techniques, machine settings and tips on how to sew several thick layers with your sewing machine. It will come a time in your sewing adventures, especially when sewing bags, when you’ll have to sew through many layers, so here’s how to get through these thicknesses and to avoid breaking your needle. If it is suitable for your project and if your layers cross a seam already sewn, press this seam open and trim seam allowances, this will reduce the bulk. Your best friend to stitch through many layers is a tough needle : use a denim needle size 90 or 100. 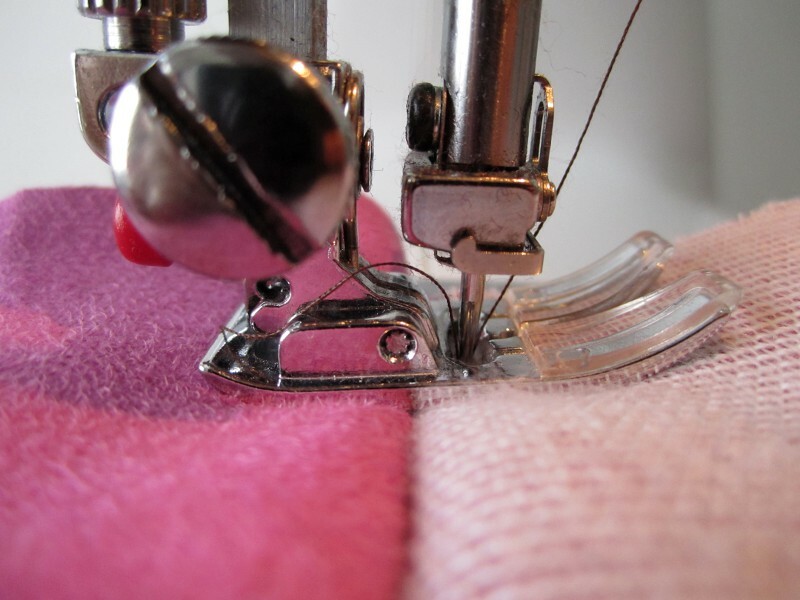 To sew pieces together lengthen the stitch length slightly. To topstitch lengthen the stitch length at 3,5 mm up to 4,5 mm. It is also often effective if the thickness is located on a small area to use the hand wheel instead of the pedal to get the stitching done. It can be difficult to sew the first stitch and to get the machine sewing when the presser foot is not leveled. That’s when you need to use a wedge. Simply fold a scrap of fabric until it is equal in thickness to your sewing project, then place it under the presser foot, at the back, to get it leveled again (see pics). Because of the thickness, the presser foot is not leveled. Using a wedge will allow you to get the presser foot leveled. – The walking foot will allow the top layer and bottom layer of fabric to move simultaneously. – The roller foot usually used for sewing “sticky” fabrics (Vinyl, faux leather, …) will also help the feed dogs to move the fabric. And what if despite all these you can’t get your sewing machine to stitch through the thickness? Unfortunately sometimes nothing will do it, some sewing machines just do not have the necessary power. Thank you for a wonderful website so helpful and easy to follow instructions. I’m glad you find it helpful ! You can also buy a foot to help with this it has a black screw on it that raises the foot – it is called a J foot in the UK (Compatible Zigzag (J) Foot by 60°® available on amazon at £3.50). I also saw a tip once on a TV craft show which was if you press down on the front of the foot it also goes quite easily over the bulk. Thanks a lot for these additional tips ! Thank you so much, I have been searching for help regarding sewing thick layers together. I am going to un-sew apron seam and sew it right. WHERE CAN ONE BUY A READY MADE PLASTIC ‘WEDGE’? Thank you for enlightening me. I was stuck. I apply a edging on a crocheted blanket – now by hand. The thickness is approx. 1″ to 1-1/2″ thick. What machine or foot will allow me to do this mechanically? 1″ to 1-1/2″ is a lot. I’m not sure a domestic sewing machine would do the trick. A walking foot is probably your best bet as far as foot goes. Your site was so helpful, I have been sewing for decades and never knew about placing folded fabric to even out the wedge. Much appreciated. Please find attached the photo of the sling net. 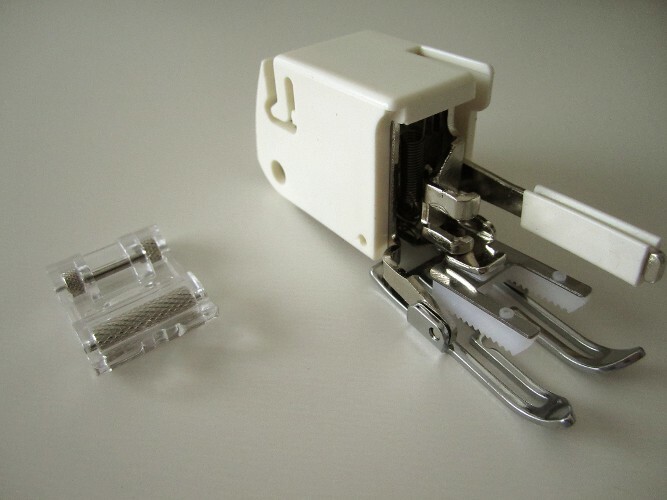 We need this sewing machine for stitching the above net wherein 3mm tape 2nos together with fabric 0.5mm with a total of 6.5 to 7mm thickness, the machine has to run over. I just got the Brother ST531HD. It is known for going through 6 layers of denim. I just quilted on it with vinyl fusible backing on the blocks, the batting and the backing. It sewed beautifully! Yay Brother! I’ve been looking at getting that same sewing machine, but everywhere I ask to see how well it worked, no one has used it. Glad to hear this! This was really helpful post. 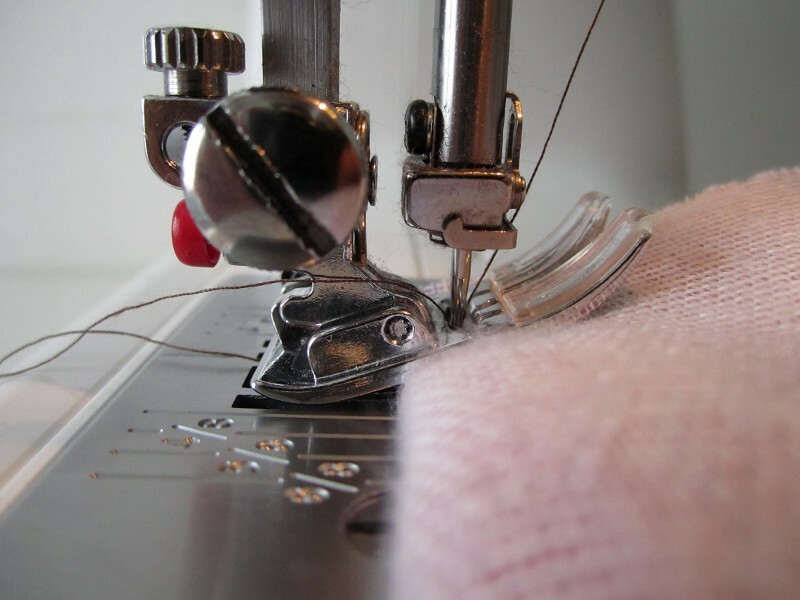 the layer of a fabric sometimes customizes the threads and the stitch as well. so we know the fabric and the layer of it and go through the layers to sew it and get stitch on it. hi, I am trying to sew through two layers of nylon webbing and approx. 4 layers of harris tweed, is a walking foot the best thing to use ? also looking at your post am I right in thinking its best to sew on a long stitch to get though all the layers. Yes a walking foot and a longer stitch works great.